Could The Cheesecake Factory, that landmark of mall dining, be coming to New York City? If so, is the suburbanization of New York City now complete? 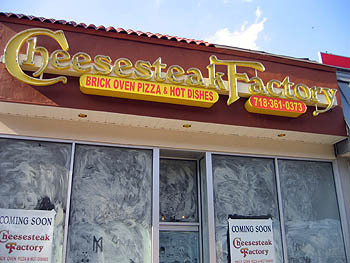 Every other major chain restaurant has opened at least one outlet here -- from the Olive Garden to Red Lobster, not to mention Bubba Gump's -- so it wasn't entirely shocking when I caught what I thought was construction of a Cheesecake Factory restaurant on Queens Boulevard at 41st Street. But something was wrong with this picture. Shouldn't New York City's flagship Cheesecake Factory be opening somewhere like midtown Manhattan? This was an awfully strange and small location, wedged in next to a Burger King in Sunnyside, Queens. I was fooled by the font. It wasn't a Cheesecake Factory, my wife told me. Look again, she said. I did a doubletake and quickly realized the sign did not read Cheesecake Factory after all, but rather Cheese-s-t-e-a-k Factory. For the Main Course, A Blog, see food bloggers in the flesh at this panel discussion with Adam Kuban (Slice and A Hamburger Today), Alaina Browne (A Full Belly) and Josh Friedland (The Food Section [that's me]), moderated by food writer Andrea Strong, Thursday, June 16, 7:30 p.m., at Makor, Steinhardt Building, 35 West 67th Street. $12/person in advance, $15/person at the door (212.415.5500). 1. Cakewalk at Grand Central Terminal, Brides magazine presents a "gallery exhibition of 50 exquisitely decorated wedding cakes created by premier sugar artists from across the United States," Tuesday, May 24, through Thursday, May 26, at Vanderbilt Hall, Grand Central Station. Free admission. 2. Find Your Soulmate, Harlem Vintage will present a tasting of wines paired with soul food, Wednesday, May 25, 7:00 p.m., at Amy Ruth’s Restaurant, 113 West 116th Street. $40/person (212.866.WINE). 3. 2005 Grand Wine Tasting, the Fulton Area Business Association will present a tasting event featuring wine and food from Fort Greene area restaurants, Thursday, May 26, 7:00 to 9:00 p.m., at the Lafayette Avenue Presbyterian Church, 85 South Oxford Street. $35/person in advance, $40/person at the door. 4. First Annual Schnack/Stahl-Meyer Hot Dog Eating Contest, competitors will race to consume a 30-inch long hot dog, Monday, May 30, 1:00 p.m., at Schnack, 122 Union Street, Brooklyn. Free beer and half-price hot dogs follow the Memorial Day competition from 2:00 p.m. until closing (718.855.2879). 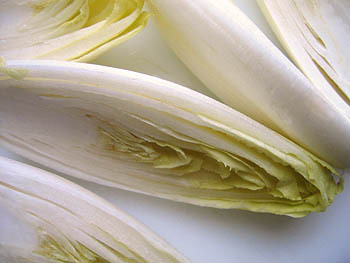 Another tip of the hat to master chef Jacques Pépin for culinary technique: this time, a simple and flawless method that turns raw endives from crisp and crunchy to silky and tender. 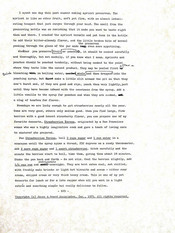 Mr. Pépin's recipe for skillet endives can be found in his recent cookbook Fast Food My Way, where he describes the technique as an alternative to a more traditional method of involving boiling and then sautéing the endives. He notes that skipping the boiling step also concentrates their subtle flavor. While Mr. Pépin suggests cooking the endives whole, I split them lengthwise. I otherwise stuck closely to his instructions. 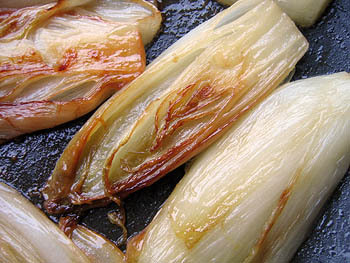 After heating a non-stick pan with olive oil and butter, I added the endives, sprinkled them with sugar and salt, and let them cook, covered, over low temperature, turning them occasionally. Thirty minutes later, the endives were soft, caramelized, and faintly sweet. Remove the cover, crank up the heat to reduce and evaporate any remaining liquid released by the endives, and serve immediately. 1. Food and Dishing, Gourmet magazine editor-in-chief Ruth Reichl will talk with gossip columnist Liz Smith, Wednesday, May 18, 8:00 p.m., at the 92nd Street Y, 92nd Street at Lexington Avenue. $25/person (212.415.5500). 2. The Great Match, tasting event pairing Spanish wines and tapas, benefiting City Harvest, Thursday, May 19, 6:00 to 9:00 p.m., at Metropolitan Pavilion, 125 West 18th Street. $50/person, advance tickets only (866.849.8703). 3. Taste of Tribeca, annual culinary festival benefiting PS150 and PS234 will take place on Saturday, May 21, 11:30 a.m. to 3:00 p.m., Duane Street between Greenwich and Hudson. $40/person in advance, $45/person on the day of the event (advance purchase at ticketweb.com). 4. Brooklyn Pigfest, fifth annual beer and barbecue festival, Saturday, May 21, 1:00 p.m. to 6:00 p.m., at the Brooklyn Brewery Yard, 124 North 12th Street, Williamsburg. $75/person advance, $85/person at the door (tickets: brooklynbrewery.com). 5. Burgundy Spring Tasting, the dining series foodie will offer a six-course seasonal menu paired with wines, Sunday, May 22, 5:45 p.m. to 9:30 p.m., at Divine Studio, 21 E. 4th Street, Suite 605. $105-$205/person (rsvp: joe@foodienyc.com). 6. Barbecue Society, the New York State Chapter of the New England BBQ Society will hold its inaugural meeting on Sunday, May 22, 12:00 p.m., at Paul Kirk's RUB restaurant, 208 West 23rd Street. A tasting menu is available for $25/person; rsvp by May 19 to nycbbq@hotmail.com (718.997.8572). 7. "Not-Just Riesling" Riesling Dinner, five-course menu featuring pairings of German wines from small family producers, Sunday, May 22, 5:30 p.m., at Tocqueville, 15 East 15th Street. $150/person, reservations required (212.647.1515). 8. Toast of the Town, annual wine tasting event presented by Wine Enthusiast magazine, Monday, May 23, 5:00 to 7:00 p.m. (VIP Tasting) and 7:00 to 10:00 p.m. (Grand Tasting), at the New York State Theater at Lincoln Center, Broadway at 64th Street. $95-$175/person (800.847.5949). 9. Beyond Farmers' Markets: Putting Food Systems on the Urban Map, the Baum Forum on Sustainable Food and Farming will present "Food Systems Planning Exercise for a NYC Neighborhood," the final installment of its four-part series on food systems, Tuesday, May 24, 7:00 p.m. to 9:00 p.m., at The Graduate Center (CUNY) 34th Street and Fifth Ave. $25/session, $80/series (212.817.8215). Living in an apartment six stories above ground makes it problematic to indulge the seasonal stirrings to fire up the grill. Hemmed in by walls, I've resorted on more than one occasion to using a cast iron grill pan, which actually does an adequate job except for the profusion of smoke that results. Despite an elaborate arrangement of multiple electric fans intended to propel the murk out the kitchen window, this never really works, and I end up swearing off indoor grilling until the urge strikes again. I'm left with a particular envy for those who have just a few inches of outdoor space in which to create a fiery surface for Pollo al Mattone or even fresh fava beans. 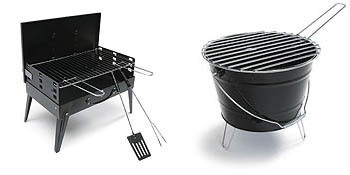 This brings me to grilling gear, which holds a peculiar attraction, especially since I have no use for it. On a recent visit to the Terence Conran Shop, home to ultra-modern, high-priced products for the home. The store, underneath the Queensboro Bridge, has a large selection of super sleek kitchen supplies and tableware, not to mention grilling tools. Like a piece of barbecue spy-ware, the portable Picnic Grill (above left) from Sagaform folds up into the shape of a briefcase. I also liked the simple design of this the Bucket Grill (above right), made by Sagaform as well, which is manufactured in green, chrome, and khaki, as well as black. Even though I've never found the heat of a grill to be so intense that I could not risk seasoning up close and personal, this barbecue salt and pepper shaker, at right, seemed ingenious. Designed by Viceversa, the tool's long handle extends to a double-headed container for sprinkling salt and pepper. While the barbecue salt and pepper shaker is not available for puchase online, the Picnic Grill and Bucket Grill (in black) are available at The Conran Shop web store. 1. Interactive Cheese Lab, Max McCalman, maitre fromager at Picholine and Artisanal, will pair seven artisanal cheeses with four wine varietals from New York’s Wölffer Estate Vineyard (guest comments and feedback from the event may be included in an upcoming book from Mr. McCalman), Wednesday, May 11, 6:30 p.m. to 8:30 p.m., at Nolita House, 47 East Houston Street. $45 (excluding tax & gratuity), reservations required (212.625.1712). 2. Taste of the Nation, annual tasting event benefiting hunger relief, Wednesday, May 11, 6:00 to 10:30 p.m., at the Metropolitan Pavilion, 125 West 18th Street. $250-$375/person (877.268.2783). 3. Grand Gourmet: The Flavor of Midtown, Grand Central Partnership will hold its sixth annual tasting event held in Vanderbilt Hall in Grand Central Terminal, East 42nd Street at Park Avenue, on Thursday, May 12, 7:00 p.m. to 9:30 p.m. $75/person (866.468.7619). 4. Pig Perfect, Peter Kaminsky, author of Pig Perfect, will give a talk about all thing porcine, Sunday, May 15, 2:30 to 3:30 p.m., at the Stone Barns Center for Food & Agriculture, 630 Bedford Road, Pocantico Hills, New York. Free admission (914.366.6200). 5. Passion for Pastry, PastryScoop.com will hold its second annual conference for pastry professionals and dessert enthusiasts, Sunday, May 15, 9:00 a.m. to 6:00 p.m., at the French Culinary Institute, 462 Broadway. $50/workshop plus a $5 service fee (888.A.PASTRY). 6. Save CBGB: Eat More Chocolate, a benefit to support CBGB promises to be "an all-chocolate, rock-and-roll experience," Monday, May 16, 7:00 to 10:00 p.m., at CBGB, 315 Bowery. $5/person. 7. Marketing Today's Specialty Grocers, the New York Chapter of Les Dames d'Escoffier will present a discussion with author Dame Joanna Pruess, Joe Dobrow, Vice President of Marketing, Balducci's, Ron Tanner, Vice President of Communications, National Association for the Specialty Food Trade, and Katy Sparks, Culinary Director, Balducci's, Tuesday, May 17, 5:15 to 7:00 p.m., at The Juilliard School, 60 Lincoln Center Plaza, Room 523 (enter 66th Street off Broadway) $25/person, $20/members (RSVP to Shelley Clark at 212.891.0204). 8. Dine Around Downtown, eighth annual tasting event of samples from more than 50 downtown restaurants, Tuesday, May 17, 11:00 a.m. to 3:00 p.m., at Chase Manhattan Plaza, between Liberty & Pine and Nassau & William Streets. Admission free, menu items $3 to $5 (212.835.2789). 9. Foods From the Waters of the World, the American Institute of Wine and Food will present a panel discussion including Trevor Corson, author of The Secret Life of Lobsters, chef Rick Moonen, and author and professor Marion Nestle, Tuesday, May 17, 4:00 to 5:00 p.m., at New York University, 70 Washington Square South. $20/AIWF members, $30/non-members (718.229.6565). 10. Beyond Farmers' Markets: Putting Food Systems on the Urban Map, the Baum Forum on Sustainable Food and Farming will present "Food Systems, Economics, and Community Food Development," the third installment of its four-part series on food systems, Tuesday, May 17, 7:00 p.m. to 9:00 p.m., at The Graduate Center (CUNY) 34th Street and Fifth Ave. $25/session, $80/series (212.817.8215). I don't like gourmet cooking or "this" cooking or "that" cooking. I like good cooking. -- James Beard (1903-1985). 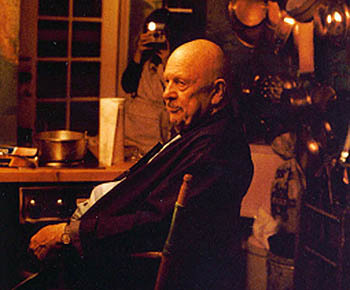 If James Beard were alive today, the celebrated chef, cookbook author, restaurateur, and culinary educator would have turned 102 on his birthday, May 5, last week. They were so tempting that as I started to dress for the evening I grabbed a handful to take into the shower. With the water running over me, I bit into these luscious berries and the flood of juice was like an internal shower of goodness. On comparing notes with my friends I found that through some incredible piece of ESP they had done exactly the same thing. It’s rather amusing to contemplate three people all standing in their showers and munching gooseberries. To explore the impact and influence of James Beard -- the driving force behind a mid-century revolution in American gastronomy -- independent producer Melissa Waldron Lehner has created a one-hour audio documentary on the "Dean of American Cuisine" entitled James Beard: A 20th Century Revolution in American Food. (Readers of The Food Section may recall Melissa from the post on International Pickle Day). Hosted by restaurant consultant Clark Wolf, a close friend of James Beard, and featuring Gourmet magazine Editor-in-Chief Ruth Reichl, historian Betty Fussell, cookbook editor Judith Jones, and Dr. Marion Nestle, author and Chair of the Department of Nutrition and Food Studies at New York University (NYU), James Beard: A 20th Century Revolution in American Food provides a personal and professional portrait of James Beard through recollections of friends and colleagues and excerpts of letters and manuscripts from the James Beard Papers, collected at The NYU Fales Rare Book Collection at the Elmer Bobst Library. 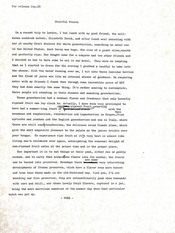 The correspondence includes letters written to and by James Beard from M.F.K. Fisher, Julia Child, and Elizabeth David. Photo: The NYU Fales Library & Special Collections. Interactive Cheese Lab, Max McCalman, maitre fromager at Picholine and Artisanal, will pair seven artisanal cheeses with four wine varietals from New York’s Wölffer Estate Vineyard (guest comments and feedback from the event may be included in an upcoming book from Mr. McCalman), Wednesday, May 11, 6:30 p.m. to 8:30 p.m., at Nolita House, 47 East Houston Street. $45 (excluding tax & gratuity), reservations required (212.625.1712). 1. Adventurous Eating, food writer and critic Gael Greene will moderate a discussion "about the world’s most unusual meals" with chefs Fergus Henderson, Mario Batali, and Lidia Bastianich on Wednesday, May 4, 8:00 p.m., at the 92nd Street Y, 92nd Street at Lexington Avenue. $25/person (212.415.5500). 2. Nothing Goes to Waste: Giuseppe Verdi, the Musician and the Gastronome, a lecture by opera expert and cookbook author Fred Plotkin, May 5, 6:00 p.m., at Casa Italiana Zerilli-Marimò at New York University, 24 West 12th Street. Free admission (212.998.8730). 3. Enotecas & Wine Bar Cuisine, Macy's De Gustibus will present a course led by Jason Denton of 'ino, 'inoteca, and Lupa on the regional wines of Italy matched with food, Saturday, May 7, 1:00 to 4:00 p.m., at Macy's Herald Square, 151 West 34th Street $95/person (212.439.1714). 4. Cheese Wars, the American Institute of Wine and Food (AIWF) will present a taste-off of beer/cheese and wine/cheese pairings, Monday, May 9, 6:30 to 8 p.m., at the Artisanal Cheese Center, 500 West 37th Street. $70/person, $50/AIWF members (718.229.6565). 5. Talkin' Tea, discussion and demonstration of how to brew a proper cup of tea, the best serving vessels for tea, tea history, and cultural and religious tea traditions, Tuesday, May 10, 6:00 p.m., at Broadway Panhandler, 477 Broome Street. Free admission (866.266.5927). 6. Beyond Farmers' Markets: Putting Food Systems on the Urban Map, the Baum Forum on Sustainable Food and Farming will present "Food Systems and the Built Environment," the second installment of its four-part series on food systems, Tuesday, May 10, 7:00 p.m. to 9:00 p.m., at The Graduate Center (CUNY) 34th Street and Fifth Ave. $25/session, $80/series (212.817.8215). Following a year of financial and organizational tumult leading to the indictment of its president and the resignation of its board of trustees, the James Beard Foundation held its 15th annual awards ceremony honoring chefs, restaurateurs, and cookbooks authors on Monday, May 2 (a separate awards ceremony for journalists was held on Friday, April 29). 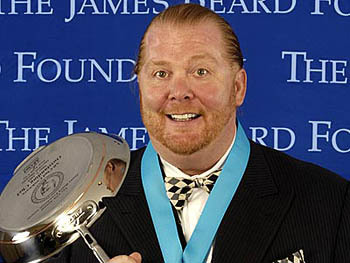 Taking top honors was chef Mario Batali, above, who was named "All-Clad Cookware Outstanding Chef." Danny Meyer, owner of the Union Square Hospitality Group, was named "Waterford Wedgewood Outstanding Restaurateur." The prize for "S. Pellegrino Outstanding Restaurant Award" went to New Orleans' Galatoire's restaurant. Locally, Andrew Carmellini of Cafe Boulud was named "American Express Best Chef: New York City." The "KitchenAid Cookbook of the Year" award went to Rick Stein's Rick Stein's Complete Seafood. In the category of "Writing on Food," Gina Mallet won for her book, Last Chance to Eat. Click here for a PDF listing all the winners in all categories.